FOR IMMEDIATE RELEASE: Pittsburgh, PA – Heyl & Patterson Inc., a specialist engineering company headquartered in Pittsburgh, has donated a collection of blueprints and photographs related to the company’s role in the construction of the Civic Arena to the Senator John Heinz History Center. 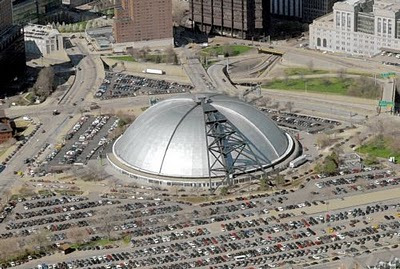 The donation was made in conjunction with Heyl & Patterson’s 125th anniversary in 2012, as the Civic Arena undergoes demolition. Heyl & Patterson’s collection of 42 drawings, plus the original contract and photographs documents the conceptualization, design and manufacture of the wheel assemblies, or trucks, that opened and closed the largest retractable stainless steel dome roof in the world. 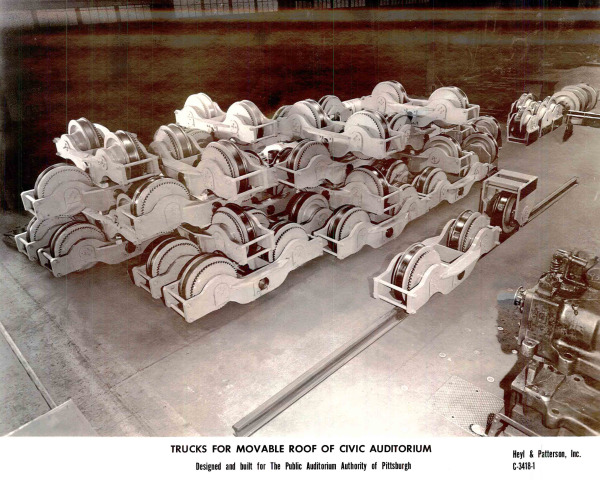 Heyl & Patterson was hired to construct the trucks by the Public Auditorium Authority of Pittsburgh on May 15, 1958, and completed the work by February 1, 1959. The trucks were then incorporated into the building’s design. A total of 42 trucks mounted on 78 wheels, 30 of which were individually driven, supported and moved the six moveable sections of the roof. Each wheel was 30 inches in diameter, and each complete wheel assembly was eight feet long and weighed 8200 pounds. The contract included the wheels, frames, chain drives and equalizers, as well as the gear motors and brakes to set the wheels in motion. All manufacturing work was performed at Heyl & Patterson’s fabricating facility in the North Side’s Manchester area. The donated items will be incorporated into the Civic Arena collection at the Heinz History Center’s Thomas & Katherine Detre Library & Archives. The museum requested blueprints and papers that would provide insight into the work performed by local Pittsburgh companies that took part in the building’s construction. Founded in 1887 in Pittsburgh, PA, Heyl & Patterson Inc. provides high quality, custom engineered solutions for bulk material handling and thermal processing applications around the globe. Heyl & Patterson innovated the Railcar Dumper Unloader and offers a wide range of bulk material handling equipment, including Railcar & Barge Movers and Barge Unloaders. Its Renneburg thermal processing products and services include some of the largest high-efficiency Dryers and Coolers in the world, as well as Calciners, Powder & Bulk Material Processors and Pilot Plant Laboratory Testing.